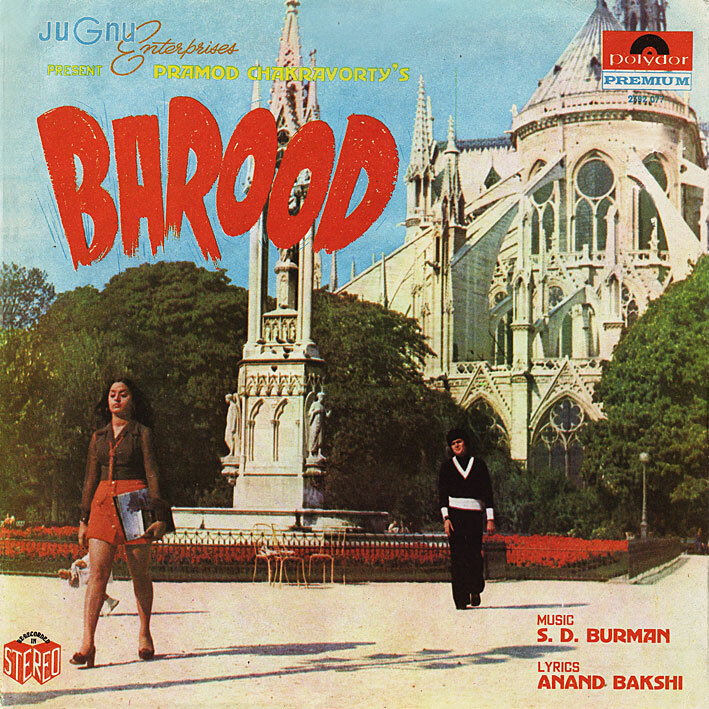 Remaining in Paris, on what I think is one of SD Burman's last scores. I might have bought 'Barood' in part due to the packaging; a lovely multifold cover (reminiscent of, if not quite as elaborate as the original pressing of 'Shalimar') and custom inner-sleeve. The latter features the press shot of Shoma Anand used in the current blog header btw. I don't find the music very exciting though... it's sort of nice and pretty, but a bit too bland for my liking. The one exception is 'I Love You, You Love Me', which has a cool Euro-bossa thing going; I quite like that. This is absolutely lovely! Dada Burman in a contemporary avtaar! Love "Ek Dushman Pe Pyar Aya Hai"! It was one of the first Indian film songs that I ever heard years ago. Thanks! I have been visiting your website for a while now and I have to mention how impressed I am by the whole blog. I have a question for you. I am very interested in knowing how do you go about scanning these LP covers. Usually the LPs are not in the best of conditions. But your scans give a feeling that they are brand new. Do you use any softwares or anything? Glad you like. I scan the covers to Photoshop, were I sometimes airbrush out creases and other blemishes, but otherwise they're as is. I tend not to buy records with shoddy looking covers. It is nice to see this post. It brings back memories. Indeed it was the debut movie of Shoma Anand. "Matlab jo samjhe " was one song from this movie that was the most popular song from this movie. This one is so HAUNTINGLY ADDICTIVE ! I actually cannot stop listening to it for a single day. I had never heard the songs or watched the movie before. I returned to write another comment on this one. I also watched the movie today and everything just fits together so marvelously ! Thank you PC. You have introduced me to numerous rarities which I never knew even existed! Thank you !